Welcome to the Val Heart and Heart Communication Enterprises Inc website. If you continue to browse and use this website you are agreeing to comply with and be bound by the following terms and conditions of use, which govern Heart Communication Enterprises Inc and Val Heart’s relationship with you in relation to this website and any services she might perform for you. The term “Val Heart” or “Heart Communication Enterprises Inc, or “us” or “Coach” or “mentor” or “we” refers to the owner of the websites whose registered office is 1738 Donerail St, San Antonio, TX 78248. THE INFORMATION CONTAINED ON THIS WEB SITE IS FOR YOUR EYES AND USE ONLY! YOU AGREE NOT TO COPY OR REPLICATE ANY INFORMATION PRESENTED HERE. YOU UNDERSTAND THAT INTELLECTUAL AND COPYRIGHT INFRINGEMENT IS PUNISHABLE UNDER THE LAW AND YOU COULD RECEIVE UP TO $150,000 IN FINES PER INFRINGEMENT. Neither we nor any third parties provide any warranty or guarantee as to the accuracy, timeliness, performance, completeness or suitability of the information and materials found or offered on this website for any particular purpose. You acknowledge that such information and materials may contain inaccuracies or errors and we expressly exclude liability for any such inaccuracies or errors to the fullest extent permitted by law. The information contained herein is subject to change without notice. The information is provided by Heart Communication Enterprises Inc and whilst we endeavor to keep the information up-to-date and correct, we make no representations or warranties of any kind, express or implied, about the completeness, accuracy, reliability, suitability or availability with respect to the website or the information, products, services, or related graphics contained on the website for any purpose. Any reliance you place on such information is therefore strictly at your own risk. We are not veterinarians and do not dispense medical advice. It is your responsibility as a pet parent to speak with a licensed veterinarian should you suspect that your animal is having medical problems. From time to time this website may also include links to other websites. These links are provided for your convenience to provide further information. They do not signify that we endorse the website(s). We have no responsibility for the content of the linked website(s). Through this website you are able to link to other websites which are not under the control of Heart Communication Enterprises Inc. We have no control over the nature, content and availability of those sites. The inclusion of any links does not necessarily imply a recommendation or endorse the views expressed within them. Every effort is made to keep the website up and running smoothly. However, Heart Communication Enterprises Inc takes no responsibility for and will not be liable for the website being temporarily unavailable due to technical issues beyond our control. DMCA Notice. This site is an Internet “service provider” under the Digital Millennium Copyright Act, 17 U.S.C. Section 512 (“DMCA”). As Required by the DMCA, this site maintains specific contact information including an e-mail address, for notifications of claimed infringement regarding materials posted to this site. * You may not, except with our express written permission, distribute or commercially exploit the content. Nor may you transmit it or store it in any other website or other form of electronic retrieval system. Remember, this information is solely for your eyes only. 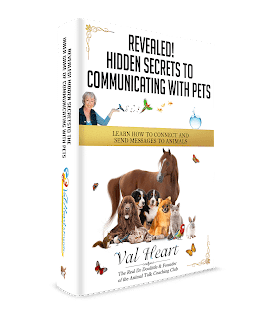 Val Heart is honored to be your guide and mentor. She is looking forward to helping you create the life and relationship with your pet(s) that you want, and have the results you envision. As you begin our coaching relationship, Val would like to present some important ideas regarding how we can best honor the process and each other. Please know that if you have questions or concerns regarding these, she is happy to discuss them with you at any time. As word of mouth is important to my business, I respectfully ask that you refer two of your friends or connections with me if you are satisfied with the results. Information shared in coaching sessions is confidential and not shared outside the session unless mutually agreed upon, and documented in writing by Coach. The only exception to this procedure would be in a situation where Coach is required by law to make a disclosure, or where Coach has a good-faith belief that disclosure of information is necessary to comply with the law, to protect Coach’s rights or property, to avoid harm to Coach, Client or anyone else, or to respond to an emergency. In such situations, disclosure would be limited to essential information. It is understood that coaching sessions are not therapy sessions, or psychological counseling sessions, nor will any coaching sessions be a substitute for counseling, psychotherapy, psychoanalysis, mental health care or substance abuse treatment. Furthermore, Client will not use any coaching sessions in place of diagnosis, treatment or therapy. Client will seek independent professional guidance for legal, medical, financial, business, or family matters. Client understands that all decisions in these areas are exclusively his/hers, and Coach acknowledges that decisions and actions regarding them are Client’s sole responsibility. Client further acknowledges that coaching does not involve the diagnosis or treatment of mental disorders as defined by the American Psychiatric Association, and Client understands that Coach is neither an employment agent, financial analyst, mental health practitioner, business manager, legal advisor, licensed therapist, psychologist, psychiatrist nor medical doctor. Client understands and agrees that he/she is fully responsible for his/her physical, mental and emotional well-being during all coaching sessions, including choices and decisions made both during and after the sessions. Except as expressly provided in this agreement, the Coach makes no guarantees or warranties, express or implied. Client agrees to utilize coaching services will the full understanding that Coach and its employees and volunteers are in no way liable for the Client’s decisions, actions and outcomes. Client also agrees to hold Coach and its employees and volunteers free of all liability and responsibility for any adverse situations created as a direct or indirect result of a specific referral, advice given or any actions taken while working with or as a direct result with Coach. . Notwithstanding any damages that the Client may incur, the Coach’s entire liability under this agreement, and the Client’s exclusive remedy, will be limited to the amount paid by the Client to the Coach under this agreement for allservices rendered up until the termination date. You understand that Val’s approach to health is that of a holistic nature. She addresses each individual as a unique being with diverse needs mentally, physically, emotionally and spiritually. There is no assurance that your animal will feel better or obtain improvement with their presenting condition(s). Val’s intent is to assist you and them with as much ease and grace as possible in as few sessions as possible. For some this may occur in a few sessions, for others it may take longer. You and your animals are ultimately responsible for your personal healing and well-being. You also understand that it may be important to receive therapy yourself in order to help your animal. If at any time you feel uncomfortable with the work, it is your responsibility to inform Val. Self-care is an extremely important part of your healing process, and Val respects and supports you in this. You are willing to also make appropriate lifestyle changes as needed. You also understand that while you and/or your animals may immediately experience positive changes and results, you could also experience temporary difficulties as your bodies repair themselves. Your symptoms may intensify for a short period before relief is felt, so don’t be alarmed if this happens. You will be encouraged because these symptoms tell you that the therapies are working, supporting the body as it makes changes, addressing problems more aggressively. You also agree to be patient and gentle with yourself and your animal as you process and integrate these changes. If your bodies must create new neural pathways or generate new tissue or cells as it rebuilds healthier organs, joints, etc., this may take a few weeks or months, depending on the complexity of the task. If for any reason you are unable or unwilling to allow the time needed to heal after a session, you will tell Val before your session so she can adjust her approach according to the highest priority. You affirm that you will state all known medical conditions, and will answer all questions honestly and to the best of your ability. You understand that this services are not a substitute for medical or veterinary examination and/or diagnosis. You understand that Val does not diagnose illness, disease or any other physical or mental disorder. Likewise, she does not prescribe medical treatments or pharmaceuticals, nor does she perform any type of spinal adjustments. Any information provided is for educational purposes only. You understand that you must re-evaluate the need for insulin or other diabetic regulating protocol, or blood pressure regulatory medication(s) every day while you and/or your animal work with Val because you know that the body may make fundamental changes very quickly. You hereby agree that you are willing to do so in a responsible manner. You understand that your appointment purchases Val’s time.If you have a legitimate emergency, we’ll work around it. Otherwise, missing an appointment without advance notice is considered a paid appointment because if you don’t show up for your appointment, you still owe for her time. If you show up late for your session, then you will lose that missed time. To reschedule or cancel an existing appointment, please call us at (210) 860-7713. We have a strict 48 business-hour session change policy so we have enough time to offer your appointment to someone else who needs it from our wait list. At that time, a session can be re-booked to a new date providing you adhere to the 48 business hour change policy. If you have invested in a series of sessions and miss a session, then that time will be deducted from your balance of time. By law, you have 3 days to change your mind about working with Val and get a full refund. After that, there’s no turning back because we are committed to the process of working through whatever comes up. Your information will never be sold or shared with a third party, ever. We may change this policy from time to time by updating this page. You should check this page from time to time to ensure that you are happy with any changes. This policy is effective from December 19, 2012. We may collect the following information: * name * contact information including email address * demographic information such as postcode, preferences and interests * other information relevant to customer surveys and/or offers * information that you provide through your coaching notes or Forum interactions. We require this information to understand your needs and provide you with a better service, and in particular for the following reasons: * Internal record keeping. * We may use the information to improve our products and services. * We may periodically send promotional email about new products, special offers or other information which we think you may find interesting using the email address which you have provided. * From time to time, we may also use your information to contact you for market research purposes. We may contact you by email, phone, fax or mail. * We may use the information to customize the website according to your interests. Success Story” or “Best-Case” Testimonials We Post. For Testimonials we post on our site that are in the nature of “success story” or “best-case” scenario testimonials (as distinguished from subjective opinions), we have data that will substantiate the results and also provide statements of expected typical results we believe consumers will generally achieve with our product or service, and we will provide this information upon request – email compliance.officer-at-valheart.com. Subjective Opinion Testimonials We Post. For Testimonials we post on our site that are in the nature of subjective opinions, we do not independently verify, nor do we seek independent verification; however, to the best of our knowledge we believe the testimonialists are giving their honest opinions. If you are not sure regarding whether a particular testimonial is a “success story”/”best-case” scenario testimonial or a subjective opinion testimonial, email our compliance officer at the email address provided above and request clarification. Blog Posts by Others. We do not independently verify, nor do we seek independent verification of comments and statements that may be posted by others in blog posts on this site regarding our website, its products or services. For this reason, if others post “success story” or “best-case” scenario testimonials (as distinguished from subjective opinions), you should assume that their results are NOT typical because everyone’s story is their own based on their unique journey and process. You may request details of personal information which we hold about you under the Data Protection Act 1998. A small fee will be payable. If you would like a copy of the information held on you please write to Heart Communication Enterprises Inc at 1738 Donerail St, San Antonio, TX 78248, USA.